Biography: Joseph O'Connor was born in Dublin in September 1963. 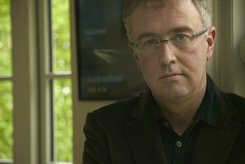 He attended UCD from 1981 to 1986, gaining a first class honours B.A. in English and a first class honours M.A. in Anglo-Irish literature. Thereafter he attended Oxford University for a year. He also holds a Screenwriting M.A. from the Northern School of Film and Television, Leeds University. In 1988 he became a fulltime writer. He has published 7 highly acclaimed and award winning novels published in translations worldwide, and five non-fiction books, and has had 10 no. 1 bestsellers in Ireland. His novel STAR OF THE SEA became no.1 bestseller in the UK in February 2004, and went on to sell 900,000 copies in the UK. Film rights are under option to Parallel Films. It was one of the top ten bestselling books in Britain in 2004. He has adapted three of his novels and three of his short stories for the screen. Recent script-writing work includes THE VAMPYRE MAN, a film commission from BBC Northern Ireland about the relationship between the author of Dracula, Bram Stoker and the actor Henry Irving. Joe's stage adaption of Daphne du Maurier's MY COUSIN RACHEL had a sell-out run in a production at the Dublin Gate Theatre in Easter 2012, and enjoyed a second run in Christmas 2012. He is writing the book for a stage musical for John McColgan.